Eighty-nine percent of humanitarian migrants (including their family) experienced traumatic events prior to migrating, including war, persecution and extreme living conditions. At the time of surveying, 35% of males and 45% of females were at moderate or high risk of psychological distress, compared to 7% of males and 11% of females in the wider population. Eighty percent of migrants said they feel welcome in Australia. In addition, 84% rated their overall settlement experience as good or very good – although many participants were still waiting to reunite with family. Around 75% of migrants reported they didn’t understand English well or at all before arriving. However many reported their English was improving, with 69% of adults undertaking English classes. Migrants have to move house frequently due to problems finding secure housing. Three quarters of respondents said it was hard or very hard to find housing, most commonly because of housing costs (57%), language difficulties (50%) and lack of rental references (49%). Humanitarian migrants are fleeing trauma and persecution. Many have spent periods of time in refugee camps or detention centres pending resolution of their status. The journey that people make from refugee to citizen is one where they will encounter many hurdles, but also support from people who took the journey before them, from the community, and from different levels of government. Worldwide, there are more than 15 million people who have fled their country for safety, including 3.9 million from Syria, 2.6 million from Afghanistan and 1.1 million from Somalia (World Bank, 2015). Migrant communities have made considerable contributions to Australia's economic and social wellbeing (Hugo, 2011). Understanding how humanitarian migrants settle in Australia is paramount to ensuring effective policy and program responses; however, detailed research in this area has been lacking. This fact sheet describes the pre-arrival and early settlement experiences for a cohort of humanitarian migrants who arrived in Australia or were granted their permanent Australian visas during May and December 2013. The offshore resettlement stream includes two categories of visas for people who are outside of Australia at the time of applying for a visa. The Refugee category (visa sub-classes 200, 201, 203, 204 ) is for people who are experiencing persecution in their home country, are typically outside of that country, and are in need of resettlement. The Special Humanitarian Programme category (visa sub-class 202) is for people who are subject to substantial discrimination amounting to gross violation of their human rights in their home country, and who are proposed for entry by an Australian citizen, Australian permanent resident, eligible New Zealand citizen or an organisation operating in Australia. The onshore stream (866 visa sub-classes) covers individuals who arrive in Australia before applying for a humanitarian visa. They may have arrived by boat without a visa (Unauthorised Maritime Arrivals; UMA),* or by other means on another type of visa (e.g., tourist, student visa). Note: * This is the term contained in the Migration Act 1958 (s 5AA) which describes persons that enter Australia by sea and because of that entry become an unlawful non-citizen. Building a New Life in Australia (BNLA) aims to trace the settlement journey of humanitarian migrants from their arrival in Australia through to their eligibility for citizenship, in order to better understand the factors that influence a person's settlement journey. The BNLA project is expected to provide a broad evidence base to assist policy development and program improvement for humanitarian migrants in this country. What are humanitarian migrants' settlement outcomes, in particular their English language proficiency, housing situation, labour force participation, use of qualifications, income, health, community engagement, citizenship, and level of satisfaction with life in Australia? Which factors facilitate or hinder successful settlement? What role does access to and use of government and non-government services and their effectiveness play in migrants' successful settlement? Do the settlement experiences and outcomes of humanitarian migrants vary according to the differing migration pathways taken? 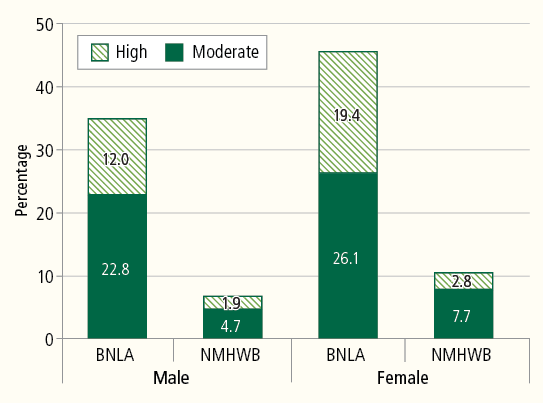 BNLA is a longitudinal research study, with data collection occurring annually for at least five years. The study recruited close to 2,400 individuals and families who had been granted a permanent humanitarian visa under Australia's "offshore" and "onshore" programs (see Box 1), and were living in communities around Australia. People were eligible for recruitment if, in the three to six months before the study, they had newly arrived in Australia (offshore program) or they had been granted their humanitarian visa (onshore program). Most BNLA participants followed an offshore pathway (84%; onshore 16%), broadly reflecting the composition of Australia's humanitarian program at the time of Wave 1 recruitment. Selection into the study was based on the "migrating unit" named on the visa application, which could consist of a single individual or members of a family. The adult "Principal Applicant" on the application (the person for whom approval for a permanent visa was based) was designated as the lead participant for the BNLA study. The Principal Applicant had to be aged 18 years or over and was required to consent to take part in the study before other eligible members could be invited. "Secondary Applicants" comprised other adults in the migrating unit aged 18 years or older, or adolescents aged 15-17 years. The questionnaire was administered via a computer-assisted self-interview (CASI), using a tablet computer, or via computer-assisted personal interview (CAPI) with a bilingual interviewer (or interpreter where required). The questionnaire and other participant materials were offered in English and also translated into 14 languages: Amharic, Arabic, Burmese/Myanmar, Chin Haka, Dari, Hazaragi, Nepali, Oromo, Pashto, Persian, Somali, Swahili, Tamil and Tigrinya. The major domains assessed include family composition and demographics; housing and neighbourhood characteristics; English language proficiency and training; engagement in other educational study or training; employment, income and financial hardship; migration pathways and experiences; physical and mental health; self-sufficiency; community engagement and support; and perceptions of life in Australia. The age of respondents ranged from 15 to over 80 years, and the average age of the adult participants was 37 years for Principal Applicants and 32 years for Secondary Applicants. While recruitment predominantly involved males at the Principal Applicant level and females at the Secondary Applicant level, there were roughly equal proportions of males (54%) and females (46%) in the cohort. 65% were young men aged 18-35. 7% were couples with no children. Respondents were asked to rate their English language proficiency before their arrival in Australia, and at the time of their Wave 1 interview, across four domains: understanding of spoken English, and speaking, reading and writing proficiency in English. 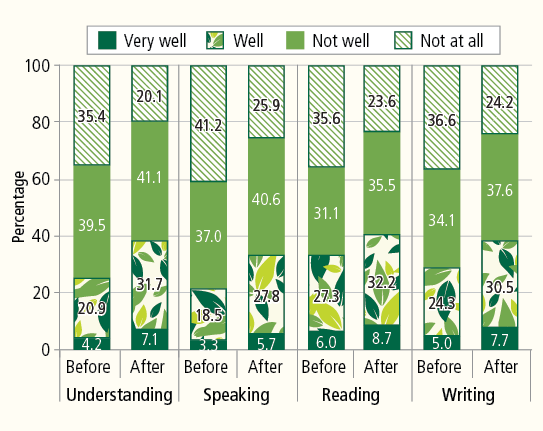 Three-quarters reported that they understood English "not well" or "not at all" before they came to Australia, and a slightly higher proportion reported that they had difficulties with speaking English at that time (Figure 1). Improvements in English language proficiency (across all domains) were reported by many participants at the Wave 1 interview, with a high proportion of respondents having taken English classes since arrival in Australia. Two-thirds (69%) of all adults reported that they were undertaking English classes at the time of interview, and a further 8% had previously studied English in Australia. Engagement in other forms of education and paid employment prior to arrival in Australia, and at the time of interview, were also assessed. Around 15% of adult respondents reported having never attended school, and a further 34% had fewer than 10 years of schooling (Figure 2). However, two-thirds (66%) of Principal Applicants planned to study in Australia, with 42% of these desiring to attain a trade or technical qualification and a further 30% aspiring to achieve a university degree. Approximately two-thirds (68%) of Principal Applicants, 30% of Secondary Applicant adults and 10% of Secondary Applicant adolescents reported having ever worked before coming to Australia, but at the time of the Wave 1 interview, few participants (7% across all respondent types) reported having worked in the last 7 days.3 It is important to note, however, that the majority of respondents had been living in Australia less than six months and, as noted, reported low levels of English language proficiency but very high rates of engagement in English language classes and other types of study. 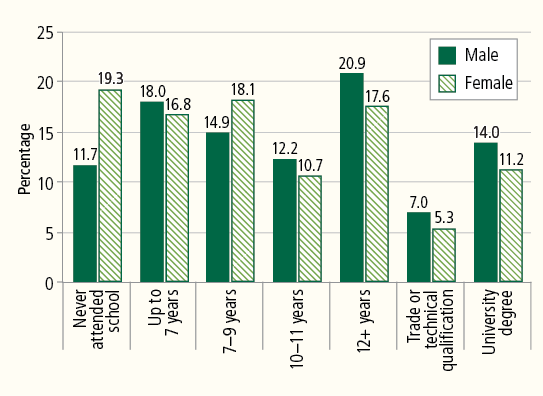 94% of Secondary Applicant adolescents were currently studying and/or employed. Findings from Wave 1 suggest that recently arrived humanitarian migrants have high levels of housing mobility. Although most respondents had arrived in Australia only 3-6 months prior to interview, two-thirds reported having moved home during this period, and around one-third of those had moved multiple times. 45% of Principal Applicants reported that their current housing arrangements were either temporary (15%) or on a short-term lease of 6 months or less (30%). Nevertheless, participants did report high levels of satisfaction with various aspects of their current housing: most were either "satisfied" or "very satisfied" in terms of the physical dimensions of their housing (such as number and size of rooms), and their access to transport, shops, schools and child care. Humanitarian migrants are often fleeing trauma and persecution, and the majority of BNLA participants (89%) reported that they or their immediate family had experienced at least one type of traumatic event before coming to Australia (see Table 1).4 Half reported experiencing war or conflict, 46% political or religious persecution, 33% extreme living conditions, 17% violence, 15% imprisonment or kidnapping, 15% another type of traumatic event, and 6% natural disasters. Some differences according to the migration pathways used were observed, with a higher proportion of onshore applicants reporting experiences of political or religious persecution (56%) and violence (27%) compared to offshore applicants (44% and 15% respectively). Offshore participants, on the other hand, reported experiencing extreme living conditions at a higher rate (38%) than onshore participants (16%). Current overall physical health and levels of psychological distress5 were also measured. "very good" or "excellent" (35%). Although BNLA participants form a diverse population with different backgrounds and current circumstances, it is clear that they have faced much adversity in their lives prior to coming to Australia. When asked to rate their health at the time of their interview compared to the six months prior to arrival in Australia, over half of all BNLA participants reported that their health was either "much better" (26%) or "somewhat better" (30%), with around a third (31%) indicating no change in health status. Principal Applicants were asked whether they knew anyone in Australia before their arrival and whether they still had family in another country waiting to migrate to Australia. Approximately half (49%) of Principal Applicants reported having had family in Australia when they arrived, and 24% had friends from where they used to live, but 27% (and an even higher proportion of participants from the onshore visa stream) did not know anyone prior to their arrival (Figure 5). Many participants were also waiting to reunite with family. Half (54%) of the Principal Applicants reported having family members in another country waiting to migrate to Australia, most commonly siblings (50%), children (32%), parents (28%) and spouses (25%). Within this group, 50% of onshore respondents were waiting for their spouse (compared to 15% from the offshore category), highlighting that while onshore respondents typically migrated as single person units, many still had partners in another country waiting to come to Australia. Overall, while a large proportion of participants arrived in Australia alone or were waiting on other family members to migrate, most reported that they had been made to feel welcome in Australia and felt a sense of belonging. A small proportion (5%) reported having experienced discrimination since their arrival in Australia, most commonly on the streets, public transport, or in their local neighbourhood. But the majority reported feeling welcomed in Australia "always" (52%) or "most of the time" (28%). Most participants reported feeling a sense of belonging, with close to half (44%) reporting this "always", 25% "most of the time", and only small proportions "hardly ever" (5%) or "never" (3%). The Wave 1 data suggest that the great majority of respondents were settling well in Australia and reported generally high levels of life satisfaction. When asked to rate their overall experience so far, 59% reported that their overall experience had been "good", and a further 25% "very good". Some differences were observed by respondent type, with adults reporting experiencing more difficulty starting a new life than adolescents. Only 7% of adolescents found it "hard" or "very hard", compared to 18% of Principal Applicants and 15% of Secondary Applicant adults. Table 2 further analyses these data and shows significant differences by migration pathway in what has helped participants start a new life. Notes: a This factor was only included for respondents who indicated that they had children, and percentages reflect the proportion of the group with children (n = 973). Totals do not add up to 100% as respondents could select more than one factor. The first wave of Building a New Life in Australia has yielded an important dataset that will help to shed light on the settlement journey for humanitarian migrants in Australia. The analyses reported here highlight the complex lives of these recently arrived migrants and the diversity of their pre-migration and early arrival experiences. While the findings confirm the vulnerability of this cohort, many positive findings are emerging, including the high uptake of English language classes and improvements in English proficiency, improvements in self-rated health, and feelings among participants of belonging and being welcomed in Australia. We are indebted to the BNLA participants for their support and generosity of time and look forward to continuing to talk with them about their settlement journey in Australia. The first wave of BNLA data is available to approved researchers from government, academic institutions and non-profit organisations. Details on how to apply for the BNLA data are available on the Department of Social Services website. Australian Bureau of Statistics. (2007). National Survey of Mental Health and Wellbeing: Summary of results, 2007 (Cat. No. 4326.0). Canberra: ABS. Retrieved from <www.abs.gov.au/ausstats/abs@.nsf/PrimaryMainFeatures/4326.0?OpenDocument>. De Maio, J., Silbert, M., Jenkinson, R. & Smart, D. (2014). Building a New Life in Australia: Introducing the Longitudinal Study of Humanitarian Migrants. Family Matters, 94, 5-14. Hugo, G. (2011). A significant contribution: The economic, social and civic contributions of first and second generation humanitarian entrants. Canberra: Department of Immigration and Citizenship. Retrieved from <www.dss.gov.au/sites/default/files/documents/01_2014/economic-social-civic-contributions-booklet2011.pdf>. Kessler, R. C., Barker, P. R., Colpe, L. J., Epstein, J. F., Gfroerer, J. C., Hiripi, E. et al. (2003). Screening for serious mental illness in the general population. Archives of General Psychiatry, 60, 184-189. World Bank. (2015). 6.13 World development indicators: Movement of people across borders. Washington, DC: World Bank. Retrieved from <wdi.worldbank.org/table/6.13>. 1 Participant characteristics are based on unweighted data. All other results are based on weighted data. 2 Further detail around the profile of participants in terms of their visa sub-class and gender can be found in De Maio, Silbert, Jenkinson, & Smart (2014). 3 Noting that employment status was not defined in the same way for each time period. Employment prior to arrival in Australia was defined as having done any work in their life before coming to Australia, whereas employment at the time of Wave 1 was defined as having done paid work in the last 7 days. 4 Participants were asked if they or their family had experienced any of the following seven traumatic events prior to coming to Australia: extreme living conditions; war or other conflict; violence (physical or sexual); imprisonment or kidnapping; political or religious persecution; natural disaster; or other traumatic event. This did not include experiences in Australia or in immigration detention. 5 Assessed using the Kessler Psychological Distress Scale, which screens for general mental health in an adult population (see Kessler et al., 2003, for further details). 6 The data for the general Australian population were obtained from the Australian Bureau of Statistics (ABS; 2007) National Survey of Mental Health and Wellbeing (NMHWB). The ABS data were collected in 2007, the BNLA data between October 2013 to March 2014. Rebecca Jenkinson is a Research Fellow, Michelle Silbert is a Senior Research Officer, John De Maio is a Research Fellow and Ben Edwards is a Senior Research Fellow at the Australian Institute of Family Studies. In 2012, the former Department of Immigration and Citizenship (DIAC), now the Department of Immigration and Border Protection (DIBP), commissioned the BNLA project. As part of the 2013 Machinery of Government changes, responsibility for the project moved from DIAC to the Department of Social Services at the end of Wave 1 fieldwork in April 2014. The Australian Institute of Family Studies (AIFS) was commissioned to manage the design, administration and fieldwork of the BNLA project. AIFS contracted Colmar Brunton Social Research, in conjunction with Multicultural Marketing and Management, to undertake the fieldwork for the project. We extend very special thanks to the humanitarian migrants who participated in this study. Published by the Australian Institute of Family Studies, January 2016.